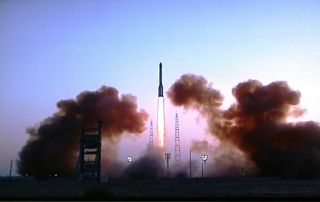 The Proton rocket lifts off with three Glonass navigation satellites. AProton rocket blasted off overnightWednesday with three spacecraft to help expand Russia's satellitenavigationsystem to provide positioning services around the world. TheProtonrocket launchedat 0053 GMT Thursday (8:53 p.m. EDT Wednesday) from pad 81 at theBaikonurCosmodrome in Kazakhstan, where the first pink hues of sunrise splashedthedawn sky. Withsix main engines burning, the Protonsoared into mostly clear skies and jettisoned its first stage twominutes afterliftoff. The three-stage rocket deployed a Block DM upper stage and thethreeGlonass payloads in space less than 10 minutes into the mission. TheBlock DM was expected to fire twice toplace the Glonasssatellites in a circular orbit 12,000 miles above Earth withan inclinationof 64.8 degrees. Spacecraftseparation occurred at 0426 GMT(12:26 a.m. EDT) in the targeted orbit, according to the Russian SpaceAgency. Thesatellites are the second group ofGlonass platforms launched this year. Three other spacecraft wereorbited by aProton rocket March 1. Eachsatellite weighs about 3,000 pounds atlaunch, including maneuvering fuel to maintan the craft's orientationin space.The modernized Glonass M spacecraft are designed to operate for sevenyears inorbit, according to their manufacturer, Information Satellite SystemsReshetnevCo. Glonasssatellites broadcast navigationsignals to military and civilian users from their orbital perch,reachingground receivers across a swath of Earth nearly stretching from pole topole. Accordingto a Russian Space Agency website,21 Glonass satellites are currently operational. Two more spacecraftareconsidered spares. Glonasssatellites are scattered in threeorbital groups, each designed for eight spacecraft to achieve globalnavigationcoverage with a total of 24 operating satellites. Threemore Glonass M satellites are scheduledfor launch in November. Reshetnevis testing the first upgradedGlonass K spacecraft for launch on a Soyuz rocket from the PlesetskCosmodromein December. The new series of Glonass satellites will feature longerlifetimesof up to 10 years.